Any director and cast of players who can turn Lifeline Theatre’s modest digs into a credible semblance of Pemberley, the grand residence of Mr. Darcy in Jane Austen’s “Pride and Prejudice,” have gone most of the distance in bringing this brilliant, consummately romantic and beloved novel to the stage. 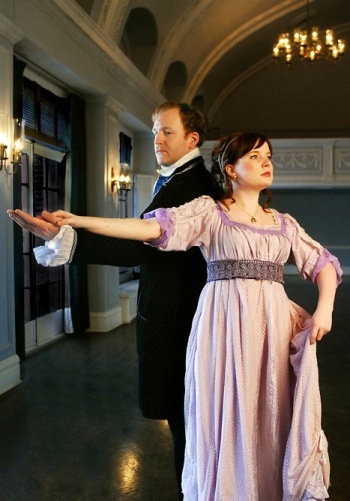 Yet so it comes to pass, in Lifeline’s lovely production, when headstrong and highly prejudiced Elizabeth Bennet together with her aunt and uncle wander into Pemberley on a tour of local mansions. It’s the same space, without a jot of extra adornment, that we’ve just taken for Elizabeth’s ordinary home; only now the amazed visitors are oohing and aahing over splendors we cannot see but readily imagine with them. The housekeeper shows them a fine portrait of the handsome owner, and moments later who should appear but the eminent fellow himself — though at the sight of Elizabeth his typically stern, cheerless mien instantly softens and he becomes affability itself, inviting Elizabeth’s uncle to fish, inviting them all back into the mansion for a drink. But you doubtless know all that, having read the book or seen the marvelous BBC miniseries (perhaps several times). My point is that this scene, so authentically and effortlessly played, serves not only as the story’s turning point but also the moment of dramatic truth for Laura McClain’s reeling Elizabeth and Dennis Grimes’ amorously discombobulated Darcy. In this outwardly unremarkable space, they absolutely stand upon a splendid estate. We have been brought to believe in it by the whole force of events beforehand. For anyone who has not encountered Austen’s sine qua non of romance novels, here’s the gist: Elizabeth Bennet and her four sisters, their usually hysterical mother and ever practical father, a family of humble gentility, reside in a home that will become the property of Mr. Bennet’s cousin in the event of his death, potentially leaving all the womenfolk displaced. Hence a certain urgency in finding husbands for the girls. The eldest sister, Jane, falls in love with a young man newly arrived in the neighborhood called Mr. Bingley, a gregarious soul as remarkable for his ebullient spirit as for his considerable wealth. His good friend is a still richer but dour, socially awkward fellow called Mr. Darcy to whom Elizabeth Bennet immediately takes a disliking that is only reinforced by reports about the man. All that follows is essentially the unveiling of a more accurate likeness of Mr. Darcy and Elizabeth’s change of heart in that changing light. 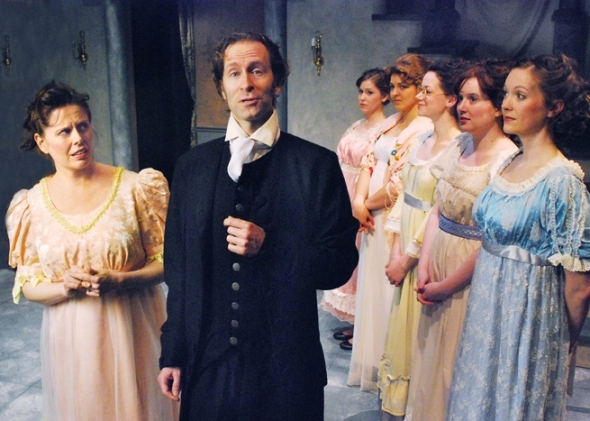 “Pride and Prejudice” is a stew of great characters, and Lifeline’s staging – in an adaptation by Christina Calvit directed by Elise Kauzlaric – gets every one of them right. To care about any of it, we must be drawn to Elizabeth’s independent spirit and buy into her misgivings about the cheerless and mysterious Darcy. And McClain is indeed an endearing Lizzy, the sharp-witted favorite of Mr. Bennet, that long-suffering father of five daughters, played with delicious drollery by Don Bender. In this telling, Lizzy is also the narrator, regularly turning to the audience to explain circumstances. McClain manages this device so off-handedly, and with such infectious dollops of irony, that Lizzy and the audience steadily grow to be pals. Grimes’ obdurate Darcy carries off the miracle of never once smiling. His finest moment is Darcy’s impulsive marriage proposal to Lizzy, an expostulation of reasons why he should view her as beneath him, barely tempered by a declaration (somewhere in there) of his undeniable affection for her. The extreme opposite of this literary icon of sobriety is Lizzy’s deeply anxious, nattering mother – embodied with scene-stealing, if not show-stealing hilarity by Cameron Feagin. If we’re pulling for Lizzy and Mr. Darcy, we’re also cheering for the perfect match of her quietly appealing sister Jane and dear Mr. Bingley, lifted right off Jane Austen’s page here in the sweet temperament of Amanda Drinkall and Micah J.L. Kronlokken’s abashed, dreamy-eyed Bingley. Nor can I leave out three more of Austen’s priceless characters done to a T: the simpering pastor Mr. Collins (Phil Timberlake), his ever so condescending patroness Lady Catherine de Bourgh (Jan Sodaro) and the manipulative, reckless interloper Mr. Wickham (James Gasber). Christina Calvit hews as close to Austen’s book as the constraints of stage production and reasonable time might allow, and director Elise Kauzlaric keeps the action flowing in full stream without turning this romance into a torrent of efficiency. There are indeed some wonderfully indulgent pauses, among them an extended dance in which Lizzy and Mr. Darcy are partners who seem destined never to be in philosophical step with each other. And another is the scene at Pemberley, when designer Melania Lancy’s attractive all-purpose set is touched by the magic of imagination to become a palace of hope. On the night I attended, the show’s first 20 minutes crept at a sluggardly pace more suggestive of a work in progress than of something ready for prime time. But once it clicked into gear, the production sailed without lapse to the end. Even a great team can take the field flat.